2. Looks Like Jax Isn’t Thrilled About Tara’s Haircut Either: You all were quite vocal in the comments last week about Tara’s sassy new prison look. 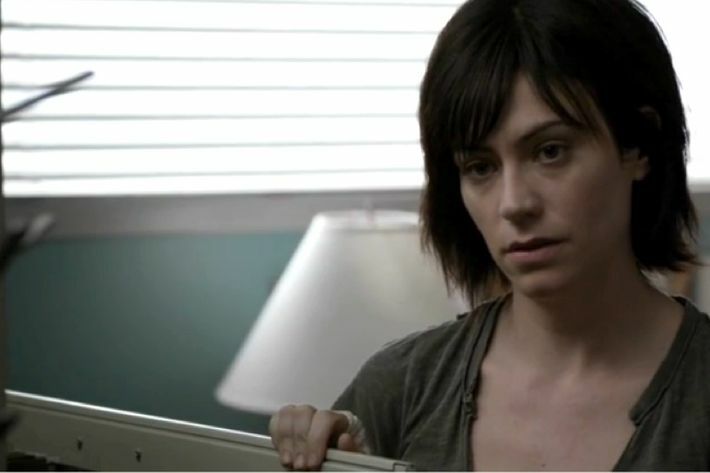 Kurt Sutter went on record that the haircut was actress Maggie Siff’s choice and not at all some kind of Orange Is the New Black statement on prison life. How chillingly distant was this curbside pickup? No dialogue at all, just stony silence and distance between our leather-clad lovers. Their wedding was only one short season ago. 3. Only One Thing More Dangerous Than a Rat, and That’s a Junkie Rat: Who thought Dave Navarro’s Arcadio and his junkie girlfriend, Darvany, would be around a lot longer? Me too. 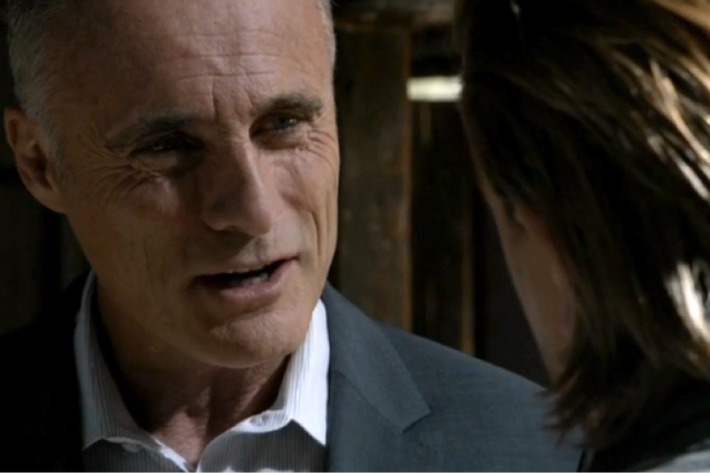 But Sons of Anarchy has never shied away from harming their high-profile guest stars. Thanks to Lee Toric, the Feds quickly connect the KG-9 used in last episode’s school shooting to the MC, and Jax and Gemma both knew that the grieving mother is a risk. Do we think the Tellers meant to dispose of Darvany from the start? Is that why they took her to Piney’s Cabin? Would it have mattered at all if she had been docile? But docile she most assuredly was not, and despite his emotional investment (Arcadio was his cousin, after all), Nero acted quickly and took Navarro out. 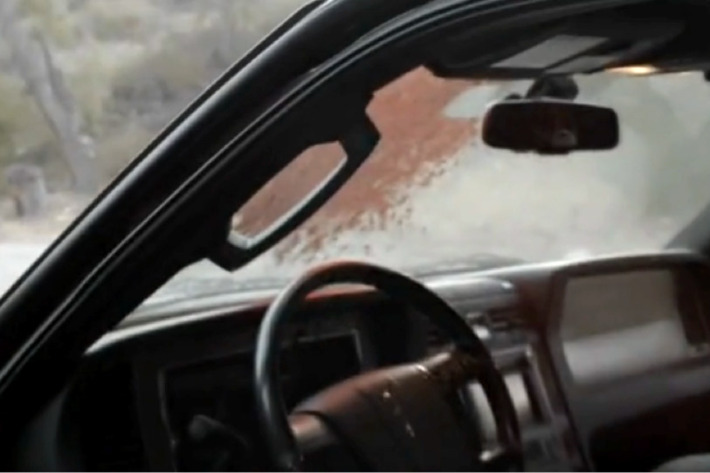 Is the blood spatter on the windshield a callback to the school violence from last week? 4. The New Kids on the Block: Kurt Sutter almost had to get rid of new characters Arcadio and Darvany because we were about to meet three more. We didn’t see either of the two important new people we met last week (though the specter of Colette loomed over Jax and Tara’s distance, and Peter Weller was on set directing the episode). But we were introduced to ATF agent Frank Egan, played with weary snark by the Soul Man himself, C Thomas Howell. Howell was recently seen on the excellent and underrated Southland, so I expect fantastic things from him. 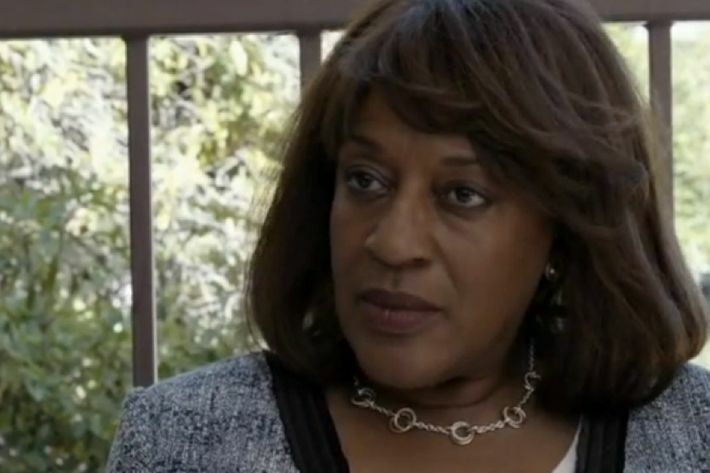 We also met the District Attorney Tyne Patterson played by the inimitable CCH Pounder (The Shield). 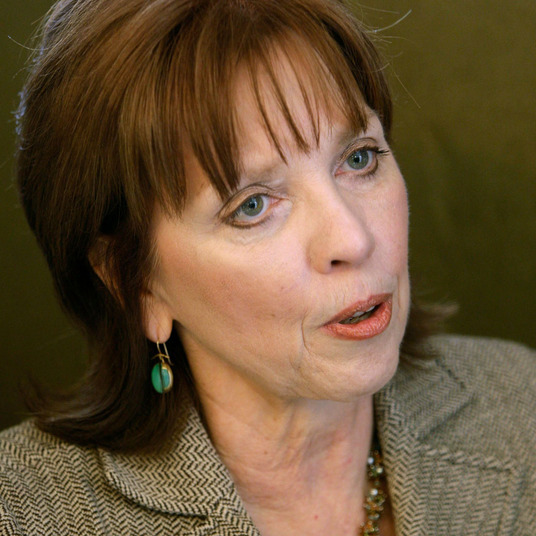 She looked all out of fucks to give when Toric tried to appeal to her better nature, but perked up when he tied taking down the MC to her political career. I think she’ll be a formidable enemy to the club. 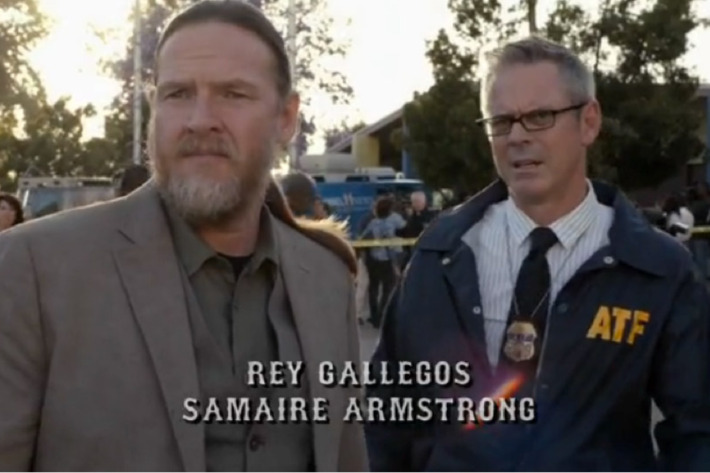 And, finally, my favorite new character is Bobby’s new ally Hopper played by Steve Howey (Shameless). 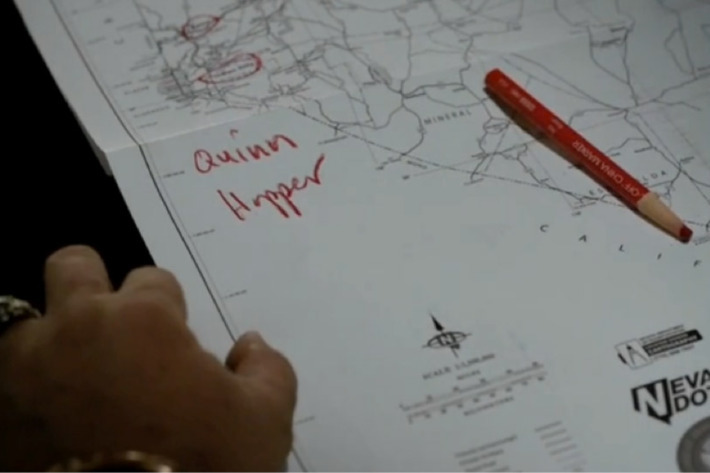 Hopper only appeared briefly in this episode, as he’s willingly drafted to Bobby’s Nomad crew. But Howey has always been phenomenal on Shameless and I look forward to seeing how they use him here. 5. Man, Irish Roger Sterling Is the Worst: So after Jax promises a bunch of things he can’t deliver to Tara (“we’re going to start earning legit … no one gets hurt anymore”), he gets put in his place by brogueish bad guy Galen O’Shay. Irish Roger Sterling doesn’t buy Jax’s frame job (that makes, oh, everyone so far) and demands access to Clay. I don’t know why O’Shay doesn’t leap at the chance to run his guns through Mendocino; they have the best saltwater taffy there. But Galen wants to double his business and Jax still wants out, which means he needs to get Galen in touch with Clay to ensure the Irish guns keep running though the East Bay. 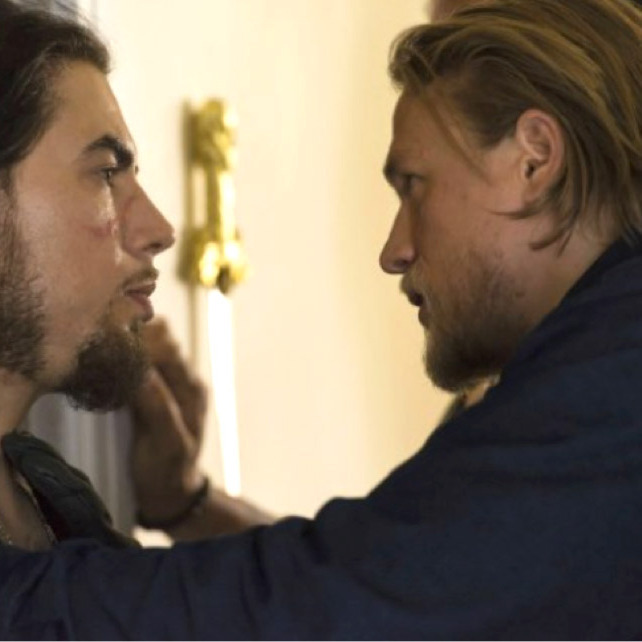 This is some tidy storytelling, because it gives Jax motivation to cooperate with Clay. In one final power move, Galen says he’s about to flood Jax with more KG-9s (once again, the gun that was used in the school shooting). Good luck getting rid of those discreetly, Jax. 6. Sisterhood of the Pregnancy Pants: In a show that’s so frequently about the boys banding together and the women tearing each other apart, it’s nice to see that Tara has built herself a small network of support. It’s also fortunate that Jax cheated on Tara last week because it makes her less of a villain in our eyes for wanting a divorce and hiding her potential pregnancy. I worry that the pregnancy plot will only serve to make Tara’s death all the more poignant this season. Then again, I’ve been predicting Tara’s death for years now and have always been wrong. But, yes, about that divorce. It looks like that’s what Tara was doing when she was in jail this past week, building a case. Lowen said she won’t file the divorce papers until right before Tara’s trial in six weeks (which could land us at the end of the season). Personally, I’m grateful for as many opportunities as possible for Robin Weigert and her shiny hair to share the screen with Maggie Siff. She’s so great. 7. And Then There Were Three: Another screen shot of Bobby’s map, Joanna? We just had one last week! Well, yes, as long as Bobby and his red grease pencil keep traveling, I’ll keep coming back to him. As we mentioned last week, it’s always useful to view Sons of Anarchy through the lens of “Hamlet.” And though Kurt Sutter has been fairly inconsistent as to which biker represents which character (both Opie and Tara can be Ophelia to Jax’s brooding prince), I think Bobby is playing the role of Fortinbras this season. Fortinbras is the offstage threat who throughout the play amasses his troops. The play ends with Fortinbras finding the stage littered with bodies and taking the throne from both Claudius and Hamlet. Will the series end with Bobby at the head of the table? I wouldn’t be surprised. 8. Juice Goes Full Heisenberg: We spoke a little bit before about who is left in the MC for us to root for with Jax falling deeper and deeper under Clay’s shadow and his brothers following suit. 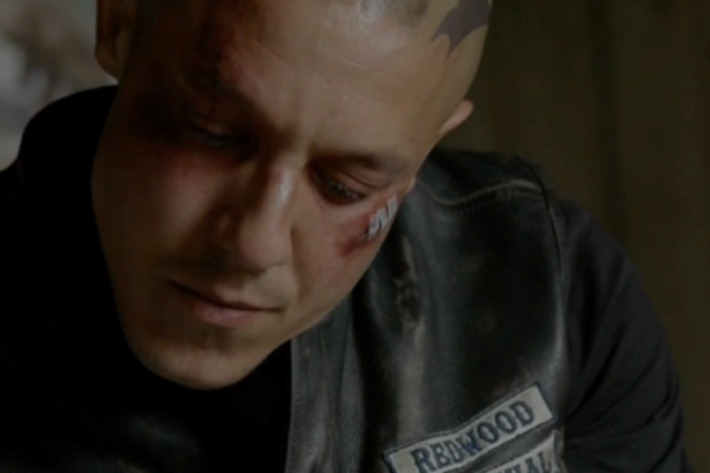 I always had a soft spot for Juice played by the delightfully vulnerable Theo Rossi. In this episode, however, Juice takes out Darvany in one of the most tender acts of brutality in the show’s history. Before he smothers her, he gently rubs her arms to, yes, find the vein, but also in an act of gentle comfort. Despite the fact that Juice is willing to do whatever it takes to win back his place in the MC, you can tell this death wears on him. (He gives his hands the ol’ Lady Macbeth scrub.) Does that make him vulnerable to be won over to Bobby’s side? I think it might. I wouldn’t be shocked to see his name in red on Bobby’s map a few weeks from now. It’s worth noting that Jax made that call against Nero’s orders, so perhaps it’s Nero we should be rooting for. Nero who, a season ago, was a legit businessman trying to buy a farm and who is now blood-soaked and embroiled, fighting to save his own soul. 9. 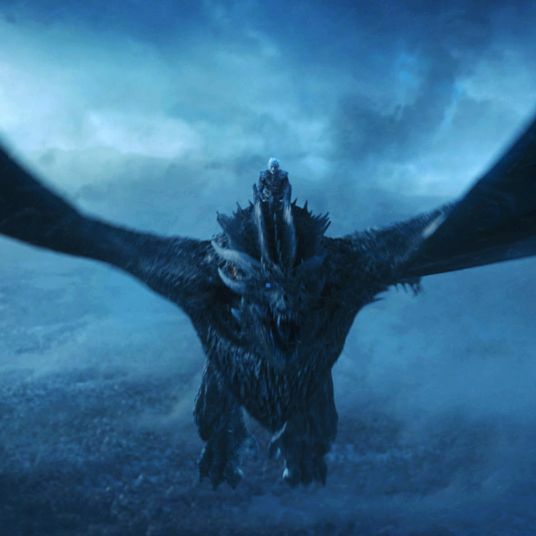 50 Shades of Grim: There’s a rumor going around that the drastically increased viewership for Sons of Anarchy has something to do with Charlie Hunnam being cast as Christian Grey in the adaptation of the bafflingly popular 50 Shades of Grey. If that’s the case, then erotica fans were probably a little let down by Jax and Tara’s grim love scene at the end of the episode. Then again, maybe her tears and obvious emotional pain are exactly what 50 Shades fans get off on. That poem wasn’t just there to remind you of your Shakespeare. The best examples we had this episode of love that “bears it out even to the edge of doom” were the tragic lovers Arcadio and Darvany. We also witnessed the effect true love has on Gemma. Clay wanted his revenge on her and so he flung the most damaging words he could. “I never loved anyone the way I loved you, Gem. I know you feel the same … I love you, Gem.” And in this episode, we saw over and over in Gemma’s treatment of Nero proof that she’s trying to stick to her thesis of last season’s finale: “Only men need to be loved, sweetheart,” she said. “Women need to be wanted.” Her face here tells a different story. The thing that kept us on Jax’s side for so long was his love for Tara. In the first season, Jax said to her, “I got tired of the endless disconnect. It was just a sad time-out. Because when I’m inside someone, there’s only one face I see. When you came home, it was like some kind of sign to me. Like my past coming around to give me another shot to do this different, better.” Can we believe that anymore after last week’s scene with Colette? Can we continue to root for this violent gangster when we no longer believe he’s doing it for his love? For his family? Then what do we have left? The steadfast love of a brother for his dead sister. Here is a man who is willing to go to the edge of doom for her. 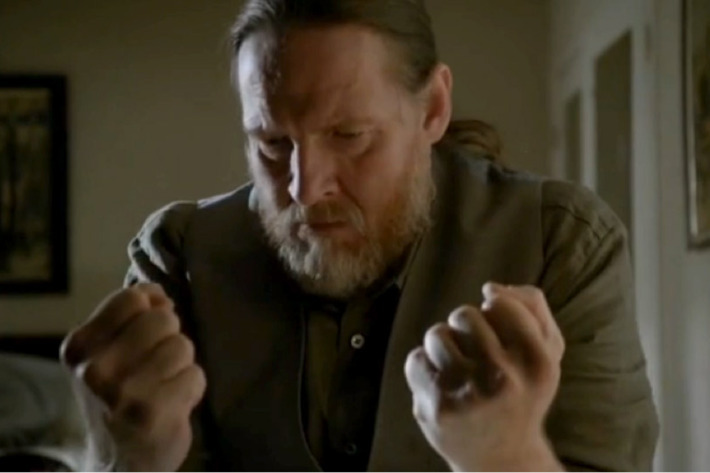 Toric does some bare-knuckle forging (did you learn nothing from Mad Men, Lee?) to get what he wants, to get his vengeance. Are we on his side?